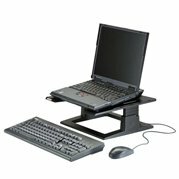 Versatile products designed to help you be more comfortable wherever you work, whether you're at the office or on the go. Raise your notebook to an ergonomically correct height and free up desk space. Height adjustable from 4 to 6 inches in ½" increments. Slots in platform help keep notebook ventilated. Cable management feature keeps cords organized. 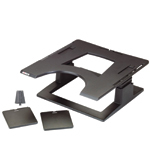 Also includes side shelves and adapter for 3M DH445 Document Holder (document holder sold separately). Compatible with docking stations. Supports up to 15 lbs. Black.